This week, the Jersey Youth Parliament was launched, with 4 political Parties. The event, held at JCG was very encouraging and a breath of fresh air, from the usual backwards, stale Jersey personality based politics. 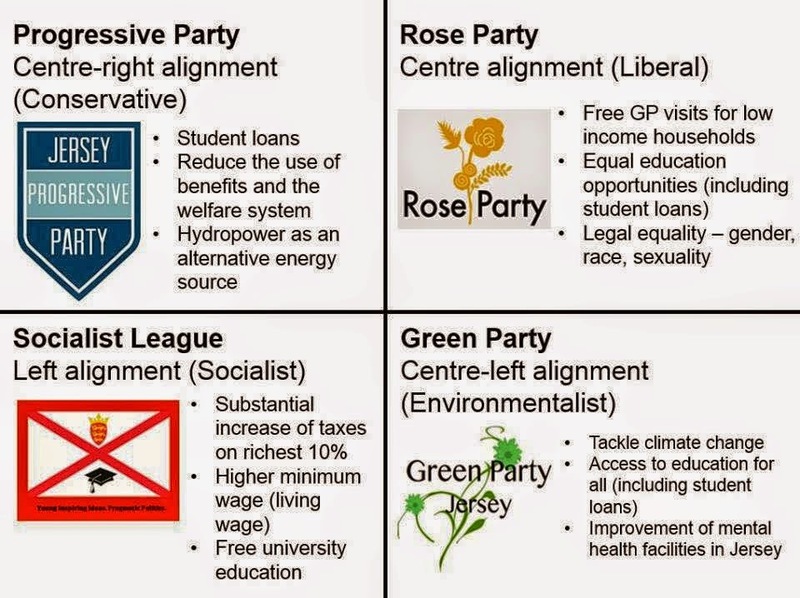 The parties (seen below) can best be described as a right-wing, centre-right - although the Rose Party might best describe themselves as centrist (akin to the Liberals), a Green Party and a Left of Centre Alliance. The Youth Parlianement, although only just starting, has managed two things that the 'real' Jersey Assembly has not: 1) It has parties, with meaningful manifestos, differing values and thought out policies. 2) It has a fair voting system - Proportional Representation. If a party gets 30% of the vote, they get 30% of the seats. The Adult Parliament, however, battles on with its gerrymandered system designed to keep the far-right in power. As such, we at Reform Jersey have prepared a very simply diagram for distribution in schools and to give to newcomers to the island, so they may better understand our Assembly- which also has 4 basic groupings (above). We hope that you will share this with your friends in order that they might better get to know the 4 parties/group and what they stand for.